(World Vision Gift Catalogue, Christmas 2013.) I do not support World Vision. Their catalogue comes in the mail anyway. A few years ago, the items that one could buy for needy people through the World Vision catalogue were more limited in variety than now. Back then, one could buy some chickens, a goat, or maybe a piglet, pretty simple. Now you can buy, in addition, a cow, ducks, a fish farm, antibiotics, winter clothes, mosquito nets, balls, blankets, lunches, art, music, education, school supplies, rescue, solar power, fruit trees, and more. It is not specified where exactly the items that one buys would go. But who cares? Are we supposed to be such stewards with our money that we need to know this? Ah! but wait! “How is it that I hear this of thee? give an account of thy stewardship” (Luke 16.2.) The people running World Vision must be aware of the fact that today’s professing Christians do not abide by the cautions in God’s word. Christians and churchgoers will give even when they cannot prove to the Lord that their money is well spent. World Vision counts on that, and exploits rampant carelessness. Is it not convenient for World Vision, and should it not be suspicious to their donors, that the items that may be bought are so numerous and impossible to account for? Well, the buyers, if they have any scruples, can soon forget about them by diverting their attention. They can smooth over their concerns by spending a little money in this catalogue on things for themselves, like ornaments, tote bags, and coffee. If World Vision is not a scam through-and-through, it is at least a scam in part. Now, besides helping poor people the world over, donors may, thanks to World Vision’s acute vision, ‘feed hungry Canadian families’ too. Reader, pull your chair up close to that computer screen. I have a modern revelation to whisper in your ear. I’m whispering now because you might not want your friends to hear what I hope you will believe. Are you ready for the shocking disclosure? Here it is: There is no poverty in Canada. ‘What? !’ you say. You heard it right. There is no poverty in Canada such as you find in Bombay, Bangladesh, North Korea, or in a Charles Dickens novel. Travel left and right and up and down this great mass of land, sir, and you will not find such poverty as that in Canada. Travel from coast to coast to coast, madam, and you will find no Oliver Twist in this country. I am not saying that no Canadian children go to bed hungry some nites. I am saying that the children who go to bed hungry in this country are not poor. When they go to bed hungry, it is because their parents or guardians have wasted their funds and neglected their children. How do you solve a problem like that? By giving the parents or guardians even more money to waste? 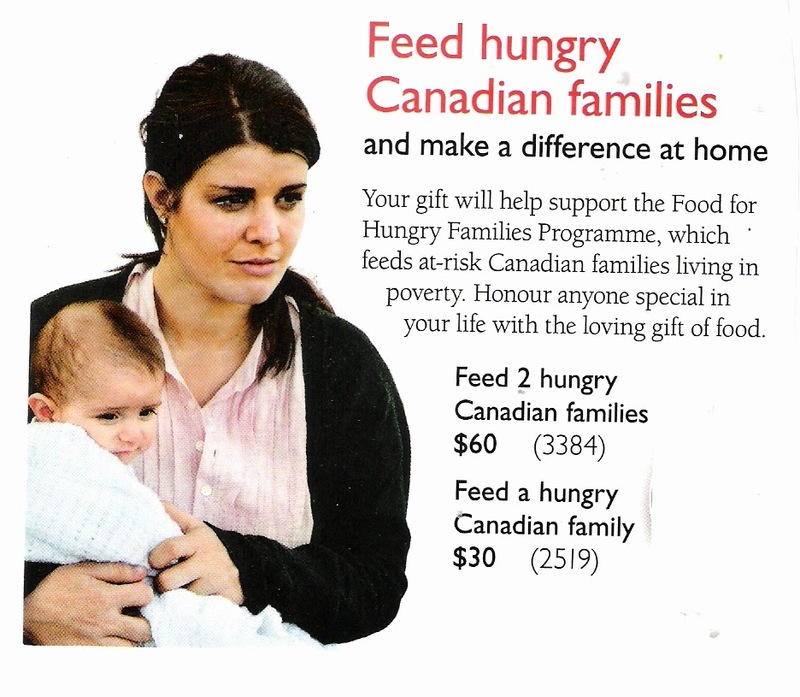 What do you think will happen if you give money through World Vision to feed a ‘poor family’ in Canada? Supposing that the money will get dispatched, will it ever get spent on food? Have you ever seen a Canadian family ‘in want’ that was not already on government support? Is the money that the family already receives wisely spent? Most often, much of that money is wasted or spent on bad habits, isn’t it? Yielding even more money into such hands will only feed indolence and addictions. And I say ‘more money’ for a good reason: responsible citizens are already furnishing these families with all they need through burdensome taxes. Years ago a coworker told me about his neighbor who, on welfare, was able to take a vacation while he, an electrician, could not afford to do the same (because he was taking care of his family’s needs.) Few people on welfare spend wisely; most of them spend sinfully. If you are one of the few who is truly disabled from working, and not scamming the system, no one would begrudge you taking a trip if you can. I am not speaking against that. Nothing that I have said needs to be corrected if World Vision aims to give food, not dollars, to ‘hungry Canadian families.’ Families who are already living on the tax money that laborers dole out do not need more food. They need to spend the free checks that they presently receive on food, not on habits, trinkets, niceties, or luxuries. Giving them food will only tempt them to use their welfare money on junk. They do not need more money, nor do they need more food. Take a peek inside the living rooms of these ‘poor’ families and you will see the big flat screen television set. I have seen this myself down the street at the ‘low rentals.’ An old tube television set is not good enough for the ‘poor.’ No, they need the latest luxury item, even if it has to come at the taxpayer’s expense and at the expense of groceries for the kids. And what do they do with their tube television that works perfectly fine and transmits a perfectly good picture? Recycle it? No, why care for the environment when you don’t care for your dignity? Just dump it out back for the garbage man to deal with. Today’s ‘poor’ people (no one who lives in a Canadian city dare deny it) take taxis to the grocery store, the liquor store, and back and forth from the casino. When you’re spending other people’s money all the time, you have no stomach for curbing your bad habits, and no time for doing anything the hard way, no matter how much money you might save by doing so. About the supposed poverty in Canada, consider those citizens who are presented as the most downtrodden segment of all: the Natives. I am part Indian myself; sometimes I am even mistaken for one; bear that in mind as I lay out some truth about the ‘impoverished’ Natives. Some Indians are noble and do very well. I am not talking about these exemplary characters, like this man named Muskrat that I knew. I have in view, those Indians who claim to be hard done by. Who in Canada is more subsidized by the taxpayer than the Indian communities? Who has not witnessed Indians driving around in new trucks that they haven’t paid for and going to bingos regularly with them? Do you know what it costs to put gas in a free truck and to play all those bingo cards on a regular basis? It costs more than many hardworking taxpayers are able to afford. Why are so many hardworking taxpayers not able to drive around in new trucks to go to bingos with? It is because they are paying for new trucks for Indians to go to bingos with. And what do these Indian bingo players do after their games are over. They go into the supermarket next door and fill their baskets with junk food. Lots of poverty to allow that to happen! When you see Native kids walking around with garbage bags full of gas to sniff, you are not looking at poverty, but at the effects of neglect and abuse. Relocating these families into new houses down the road changes nothing, as recent history has proven. More money is not the answer because lack of money is not the problem. What was ‘Idle No More’ all about? It was about Natives already on the take, making loud demands for more. What should it have been about? It should have been about Natives resolving to be idle no more by contributing, instead of taking, from society. Suppose that you are an Indian who was abused from infancy to adulthood. Does that mean that you should just take for the rest of your life and destroy your body and brain while you do nothing but sniff, drink, smoke, pop, or stuff your face with junk food? Does being abused give anyone the right to abuse the innocent taxpayer by wasting hard-won coin? At the very least, I would counsel obstinate Indians to lay off the mouthwash and drink cheap wine instead. That way, when the time of repentance draws nigh, if it ever does, the body and faculties might still be of some use. These are hard words, maybe, but each guilty Indian would do well to acknowledge their truth for his own good. The kingdom of God must be far away from every person who will not admit his most noticeable faults. “Go to the ant, thou sluggard; consider her ways, and be wise: which having no guide, overseer, or ruler, provideth her meat in the summer, and gathereth her food in the harvest” (Proverbs 6.6-8.) The Natives want to rule themselves. That’s what they say. Well, let them rule themselves on the basis of having to provide for themselves too. There are no poor people in Canada. I have yet to meet one, anyway. Are we obliged to listen to World Vision, and send in ‘$60.00 to feed 2 hungry Canadian families’? No, not until World Vision gives us some evidence of the poverty they allege. We should like to see some proof of poverty before sending our money in to relieve the ‘poor.’ Reader, realize that even your conscience is ill affected by sin. If you feel your conscience pulling at your heartstrings and telling you to give to a certain cause, it may be that your conscience is telling a lie on account of your intellect being misinformed. Calling a Canadian citizen poor is an insult to every person who has ever been poor for real. Bring a serf from the Middle Ages back to life, put him on Canadian welfare, and I guarantee you that he would think himself quite rich! And pay attention to this: “They spent less than 6d. a day each on their food: for breakfast, porridge, and, for dinner, broth and a little meat, or bread and milk, or potatoes and herrings. In the evening they usually settled for a cup of tea and had no supper unless invited to a professor’s house” (Stuart Piggin and John Roxborogh, The St. Andrews Seven, p. 25.) These seminary students did not consider themselves poor, as near as I can tell. Why do so many Canadians believe they are poor? It is because of the propaganda that says so and the arbitrary ‘poverty line.’ What family in Canada can boast of having as little to eat as these students of St. Andrews had in the 1820’s? If we were to use this quote to establish our poverty line, no family in Canada would be stigmatized as poor, a sense of dignity might be restored, and like the St. Andrews men of old, ‘poor’ people might begin to apply themselves instead of recline, repine, and whine. Some Canadians may be moderately impecunious. But my informed guess is that not one Canadian is poor. But some people are so poor that they have to eat cat food—this is what we are told. About this rumor, think about it for a second. Is it an urban legend? I hope it is, because if it isn’t, then the people eating cat food are not very smart. Rice is much cheaper than cat food. Why not eat rice instead? ‘I had to eat rice’ is not as emotionally affecting as ‘I had to eat cat food.’ If you want to eat cat food when an abundance of rice is available at a cheaper rate, more power to you. You have no one to blame for your bellyache but yourself. Maybe some of the Inuit are poor. I should address that before I wrap my article up because one of them was just interviewed on CBC’s The Current, March 28th, 2014. This Inuit woman’s case is represented on this program as typical among the Inuit. Groceries cost a lot of money in Canada’s north. The Inuit woman says that she spends about $300.00 per week on groceries for her family. And food is just one of the necessities that she has to pay for, she says. Listen, if you are spending that much money on groceries and then more money on top of that on necessities, are you poor? No, you are not poor. You have lots of money. And where is that money coming from? The question is not posed. Why not? Probably because all that money comes from hardworking, mainly white, taxpayers in the south. Maybe some homeless people are poor. Maybe, but unlikely. On CBC’s The Morning Edition for March 30th, 2014 I heard an interesting documentary about panhandlers. This panhandler was making between $80.00-$90.00 a day for a few hours of begging while his girlfriend was pulling in between $200.00-$300.00 doing the same. Probably they were receiving all kinds of other help too, like free food at soup kitchens and welfare checks from the pockets of those who actually work for a living. If there are any poor people in Canada, my guess is that they are sick righteous persons who have been denied due to unfair treatment by government social workers who discriminate against white Christian people. There was this man who had just enough money leftover for a cup of tea at the end of each month, and sometimes not even that much. But was he poor? No, he was not. He did not think so. Are there any poor people in Canada? Maybe, but if there are any, count on it, they are probably sick, male, Christian, and white. Do we need to ‘feed hungry Canadian families’ through World Vision? We are already feeding them abundantly through taxes to our government. It is time to feed these families advice, commands, and ultimatums. It is time to point an accusing finger. It is high time to do so.